Thanks to everyone who helped me demonstrate the power of personal learning networks for my presentation yesterday. Your comments, tips and advice were THE essential part of my presentation because I wanted to demonstrate a personal learning network in action to show how it extends our learning and reflection beyond what is normally achieved during traditional professional development and enables us to share our learning with global educators. The aim of this post is to show how I used your comments in my presentation, explain the main points covered plus to provide links to help others get started setting up their own personal learning network. Many of the educators at the Educational Computing Association of Western Australia (ECAWA) State Conference had never heard of the term Personal Learning Network (PLN) or Personal Learning Environment (PLE). Sarah Stewart provides an excellent overview on Personal Learning Environment and the tools that she uses in her PLE. As Graham Wegner highlights “it is hard to explain and sell what an online PLN is to educators without diving and experiencing it themselves”. This is why I felt my best chance was demonstrating a PLN in action by using the network to help create the presentation. My presentation involved a Keynote presentation composed of information collected from 27 reader’s comments to questions on Personal Learning networks blended with visiting web sites to show a range of different online tools. The title for my presentation and this post is from Ines concluding comment ” As I’ve been told myself in my first days: “You must listen to the wisdom of the network””. Thanks Ines! Face to face interactions within workplaces provides limited opportunities to exchange ideas and thoughts. Your Personal learning networks increases opportunities to help each other and is available anytime, anywhere, whenever connecting you to a global network. If you are planning to integrate online tools into your classroom it is important that you use these tools first for your personal learning to gain greater understanding of how to use them effectively and to realize their importance for empowering personal learning. It does take time “to get” the value of some online tools and it is important to engage with using them using an open mind. “Not getting” the benefits of a tool often relate to not using it effectively. 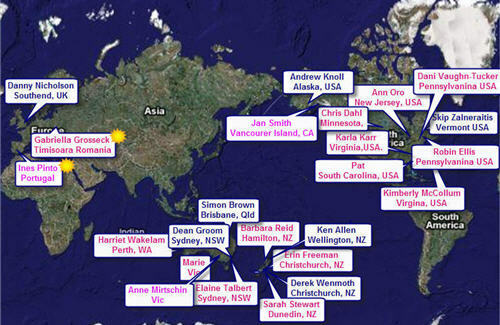 I started by demonstrating the global nature of PLNs by showing a World map with the names and locations of readers who left comments. A quicker method would have been to use a Frappr map but didn’t want people just to add their names and not answer the questions on PLNs. Next I showed a Wordle of commenters’ responses to “Why is your personal learning network important to you?” to emphasize the key reasons why educators use PLNs. Thanks Jane Lowe for providing me with the idea to use a Wordle. I then discussed tools people use to create their PLN by showing a diagram I had created using commenters responses to “Which tools are the most important part of your personal learning network?.” It was created by counting the number of readers who recommended a tool; the size and number indicates the relative popularity of each online tool. Online tools written in white text were sites mentioned by one reader only. RSS aggregator refers to use of RSS readers like Google Reader and Bloglines. Which tools people use in their PLN are very individual that is why they are personal 🙂 . The benefit of the diagram was it meant I was able to discuss and show a wide range of web sites that they could consider including in their PLN. 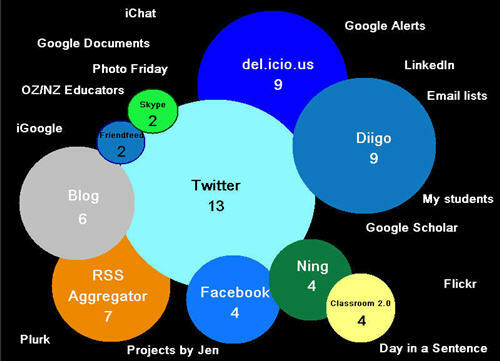 Most readers included online bookmarking sites as an important tool in their PLN however some readers included both del.icio.us and diigo in their list – I’m assuming because they use each differently? I was surprised to see Facebook included and would love to hear more from readers as to why they value Facebook so highly in their PLNs. Finally I talked about the tools for getting starting with setting up a PLN. I did this by counting the number of readers “tips on how to get started setting up their own Personal learning network” and listed them in order of popularity. Start reading blogs – You could use this list of top Edubloggers to find some blogs you would like to subscribe to. Alternatively check through this list to find blogs. Subscribe to RSS feeds using Feed Readers – understanding RSS and using it’s power to make your life easier is an essential part of using these tools. Read this post to learn more about RSS and setting up a feed reader. Start own blog – If you are interested in setting up an Edublogs blog here is where all the how to information is located. Join Classroom 2.0 – Classroom 2.0 is the largest Ning network for educators. Read this information on how to get more out of using a Ning site. Join diigo – Watch Liz Davis screencast on using Diigo. Personally though I’m sure my network meant join del.icio.us so here are my instructions for using del.icio.us. Knowledge Bank Conference 2008 – free online conference for educators on 22 & 23 July – link supplied by Janning. Top 100 Tools for Learning 2008 – list created from top 10 tools recommended by learning professionals. Link supplied by Michael Chalk. Contribute to Rodd’s survey on what tools you use in your PLN – Scroll down the page to read other people’s responses. Link supplied by Rodd Lucier. 23 Things Program – There is a 23 Things program starting on 21 July. This type of program is really good for learning about a range of online tools. Link supplied by Katherine Greenhill. Dani Vaughn-Tucker’s Importance of Personal Learning Networks post and Anne Mirtschin’s The Vital Importance of Personal Networks post that they wrote in response to my questions. Hi Sue, thank you for sharing this presentation. It gives a great framework for teaching people. I’m sure there are many of us repeating the exact same presentation in one form or another all over the place. PS: hope your cold gets better soon. A perfect blend of form with content! Congrats, you should feel pleased with this indeed. Congratulations on an exciting and motivating keynote at the ECAWA conference Sue, and thank you to all the people who contributed ideas – i got so much out of it! I’m now working my way down the list of all the new things I’m going to try…. This is simply superb, Sue! And thank you to you and all the people that helped to create such a splendid work. Like Technochalkie “I’ve got so much out of it”! Hi Sue, thank you for the opportunity not only to contribute, but also to share your research findings. All this while you’re sick, too. Greatly appreciated! Sue, congratulations. This is a wonderful presentation. I thank you for giving me the opportunity to contribute and I’m glad my comments were helpful. Thank you for sharing the outcome of your work. This is how my presentation should have turned out, Sue. Well, I don’t quite have your talent but everything you covered in 30 minutes is what I wanted to tackle and more in 45 minutes – and I didn’t really get there. Brilliantly done – and you honoured your PLN’s responses a lot better than me. @Sarah Quite a few of us recently have had to do presentations on PLNs so its interesting to see how each of us tackle the task. I try whenever possible to demonstrate the process in action in the hope it makes the participants visualise the benefits. Cold is definitely getting better thanks. @Darcy1968 I’m happy with how the presentation went — considering that I wasn’t well. And I’m pleased to see that some of the participants have taken on board the information I shared. @Technochalkie I’m glad you enjoyed the presentation. Please don’t hesitate to contact me if you need any help as you work through and try out new tools. @John Thanks 🙂 I’m glad it has aslo made you think about ideas for your upcoming presentation. @Ines I thank each and everyone of my network that helped me with this presentation. Thanks for your words which I used for the title of this post and the presentation. @Simon I wish I could have thanked everyone who helped with the presentation more than just sharing the research findings. Meanwhile I’m still pondering how FaceBook is being used in people’s PLNs. @Dani Thanks for taking the time to write the post. I really appreciated it especially since it is important for showing how blogs posts connect with each other. Analysing the information that everyone shared was challenging but important so that others could draw their own conclusions and reflections on what it all meant. @Graham Thanks but I’m sure your presentation went well too — as you said its really hard to explain PLNs without experiencing yourself the learning. I wish I had been able to honor their excellent response more. I have always pooh hoohed Facebook because I have to admit that it’s starting to figure in my PLE because people are connecting with me through it (I do not deliberately connect with people through FB because I’d rather use my blog) . And I am using it to get information out to people. Interesting, isn’t it?! Hi Sue and thank you for visiting my blogroll!! Thanks for passing on the Wordle website and how it could be used to find and display the most important ideas in a set of responses. Oh, and the other stuff about PLNs was useful too! Thanks for this research into PLNs. I was also just commenting on Liz B. Davis’s recent blog post about starting up PLNs about the absence of any mention of virtual worlds like Second Life, which is a huge and varied PLN source and community. Now that I have straddled both virtual and other online communities, it seems almost has if there is a sizeable separation between these 2 sets of PLNs. I find that interesting to reflect upon. Virtual world members are more likely to crossover into non-3D communities (such as twitter, nings, social this and that, etc.) than visa versa. It would be interesting to investigate if there is a connection between right- and left-brain dominance and preference for virtual and non-virtual communities. RBers are more able to go over to the left side that LBers are able to shift to the right. Anything there? My guess is that the response to your PLN survey, as is Liz’s reflects your own PLN (and thus “you”) and their “blindspots” and not the entire population of educational PLNs out there. This evidenced by the lack of virtual worlds data response and Plurk being in the black outer areas, both PLNs which you yourself do not really participate in. I guess that’s why it is called a Personal Learning Network after all. I wonder what a more GLOBAL data set would look like? @Frank My latest survey using Survey Monkey currently has 133 responses. I created the Survey Monkey in response to flaws that I felt were present in my original survey which was based on readers comments. Unfortunately it’s not prefect because I had to reduce number of options in first question to make it easier to rank responses. Another flaw is I think the responses are heavily weighted by where people heard about the survey. For example many heard about it via twitter so these people rank twitter highly. A good addition to the survey would have been where did you hear about the survey so we could work out how much it influences their response. The new survey included virtual worlds and you also see that Plurk rates highly. Meanwhile I stuffed up and forgot about the humble wiki. If you would like a copy of the Excel spreadsheet please let me know. My gut feeling is that Virtual Worlds appeal to a particular personality type — not sure which but they are either an important part of how you like to learn or you aren’t fussed. Similar to twitter — some people really love twitter and yet others really hate.